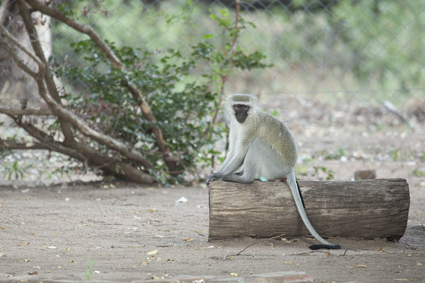 I think it is safe to say that I have a bit of a love-hate relationship with the Vervet monkeys that live around the staff village. I love watching their antics; using the trees as a jungle gym swinging from the low branches, jumping from high to low, chasing each other around in the tops of the trees. It is all very entertaining to watch and they look like they are having such a fabulous time! Especially for the young ones, it looks like life is just play, play, play. And they are pretty darn cute too! The children also love watching them. And I don’t mind as long as it is from the safety of the house. So that is a part that I love about them. Watching them in their natural environment, doing natural monkey things that wild monkeys do. What is also great about having them around is that their alarm calls warn us of any potential danger around. Like snakes for example. One morning, their alarm calls alerted us when we were on our way to the shop. By checking the direction they were looking, we found a stunning leopard just 50 meters away from the house! So that is definitely another thing to love about our Vervets. One of the monkeys raiding our dustbin. Those are nappies!! If the monkeys would just stick to raiding dustbins, it would just be a bit of a nuisance. But precautions are easily taken to install baboon and monkey proof dustbins. And when you just make sure there is no food left outside, we could in my opinion easily co-inhabit the staff village. Unfortunately, some monkeys become too used to how easy and maybe even tasty our human food is. They become what I can only describe as ‘delinquents’. They turn to criminal activities such as breaking and entering, armed robbery (have you seen their teeth? ), shoplifting and assault. Luckily these primates are the only criminals we are faced with here in Kruger, where we live in a relative safe haven compared to big cities like Joburg and Pretoria. The odd exception there of course. I witnessed the latest criminal offense in the staff village the day before yesterday. The monkey gang leader was sitting on top of the duty managers house, his blue package visible for the world to see and his buddies were all over his garden. When I had a bit of a closer look, I saw that one of the windows was open and the mosquito gauze had been broken. Classic signs of a break in! Now, these monkeys are not scared of women and children. So I approached the house with caution and urged the kids to stay in the car. I phoned one of my other neighbors to come and assist. (I sometimes feel like we should start a neighborhood watch!) As he got closer to the house, monkeys started spilling out of the window with the broken gauze and also out of one of the bathroom windows. They were caught red-handed and they knew it! I had a bit of a giggle. The bathroom window was flapping like a doggie door each time a monkey made his escape. My neighbor went to close the bathroom window and while he was at the side of the house, the last few monkeys tried to make their way out the window in front. They were in such a hurry all trying not to be the last one out! I peeked inside when I closed that window too. It was a mess. Luckily the doors to the kitchen were closed, but the living room looked like the monkeys had a fantastic party in there. There was poop and pee everywhere and the place really smelled horrible. That is not a nice after party clean up I can tell you! Like I mentioned before, these monkeys are not scared of women or children. And I have a hard time when they are around the house. Especially when Steven is on trail. It sometimes feels like the house is under siege when a bunch of them drop down from the trees and run from one end of the zinc roof to the other. It can sound quite intimidating with the zinc amplifying the sound. Then there is always one or two that will sit on the windowsill by the kitchen. They peek inside to see if we are home and if the house is a possible target for their next attempted B&E. Then they do the rounds past all the dustbins to see if there are any easy pickings. Our boys love watching them. The two of them stand at our sliding door for ages. They watch the monkeys and laugh their heads off when they do something silly. But the monkeys would rather do their criminal monkey things in peace. They will sometimes charge up to the kids behind the sliding door, teeth exposed and eyelids raised in an attempt to intimidate the boys. They don’t see it as such and just laugh and laugh tapping the glass to try and get another reaction out of them. But this is when this interaction between my boys and the delinquents can potentially become dangerous. Alex has already had a narrow escape or two where a monkey charged and almost bit him. (I wanted to charge him with assault, but the perpetrator fled the scene before I could make an arrest) That ‘fun’ game quickly turned into tears but was also quickly forgotten. That is a reason however why I do not want the children to play in the garden without supervision. When Steven was growing up, his parents took him and his two younger brothers to Kruger often. I think it was during those holidays that Steven developed his love for the bush and when he started dreaming of a career in the park. With becoming a section ranger his ultimate dream. Steven has extremely fond memories of those holidays.He loves to tell me stories about the monkeys and their crimes in those days. So the three boys would warn their parents of any approaching monkeys so countermeasures could be put in place. One afternoon they were busy packing a few things into the car for the next mornings drive when Stevens youngest brother -he must have been around 5 at the time- came running towards the rest of the family yelling: “The perverts are coming! The perverts are coming!” He obviously meant that the Vervets were coming and everyone had a lekker laugh about the mistake in his wording. Steven and I still yell that to each other whenever we see a Vervet monkey invasion is at hand. To combat any such invasion we have tried and tested a few tings to keep the Vervets away from the house. One thing they are petrified of is a snake. So I bought a whole bunch of cheap but realistic looking rubber snakes at the Crazy Store. We strategically put them in certain spots our stoep and at our sliding door. My goodness did these snakes create havoc in the monkey community! One unsuspecting monkey got such a fright he jumped about a meter into the air and screamed all his way up a tall tree. He watched the snake from the safety of his tree with a horrified look on his face, shouting alarm calls to his friends. For a few days, the Vervets would not come near the house. But we could hear them shouting all sorts of monkey profanities to the harmless rubber snakes. Unfortunately the rubber snakes did not fool the monkeys for long and they were exposed as fake after only a few short weeks. We started to move the snakes around every day, which kept them at bay for a few weeks longer. We have not found a permanent solution yet; so I guess we will just have to try and find a way to co inhabit the staff village that works for all parties involved. The verdict is still out on that one. So I guess the relationship between the Vervet monkeys and us will always be one where we love certain things and hate other things about each other. We have accepted that is part of living where we do: the beautiful Letaba in Kruger National Park! Hmmmnn. Not too easy to live with those perverts . . . . 🙂 We don’t get all of the other excitement’s you have, but there are many areas around where I live that are under siege in the same way from the vervets, and I really wish that someone could come up with a win-win solution because its not much fun to be confined inside a closed house as some people are. Hi Sal, Yes I can only imagine that these Vervets become a problem in other areas too… very sad. I remember many years ago we were camping at Balule when these little monkeys broke into a caravan – all lace trimmings and all – that couple were devastated! There caravan pooed an wee-ed all over. So sad. they left the following day for home, could not stay! I remember a baboon jumping onto a tent in Maroela, breaking all the poles, and again the couple had to go home. What do we do with these monkeys and baboons??? Love your blog Linda. Hi Wendy! I wish I knew of an easy solution… It is devistating to hear that those people had to cut their holiday short because of what happened! All I can do is encourage people not to feed any animals!! Hi Rhona! Yes I agree, feeding the young ones is probably what started all the bad behaviour way back when.. People should know better by now! Learn to use a kettie (catapult). The boys will love to practice on tins and the monkeys really respect that show of force and determination.